Orange County is now home to the largest public-private compressed natural gas (CNG) fueling facility in the nation. 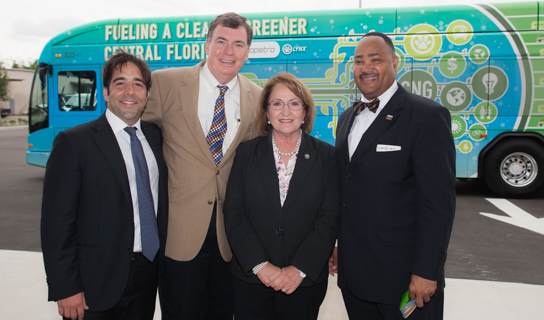 Florida’s leading CNG fueling infrastructure provider Nopetro, has built a new CNG Fueling station facility in Orange County and held a celebratory grand opening ceremony attended by Orange County community leaders and Mayor Teresa Jacobs. The facility, located at the intersection of John Young Parkway and LYNX Lane, is part of a public-private partnership (P3) with the Central Florida Regional Transportation Authority (LYNX). The six-acre facility, which includes five CNG dispensers with the capacity to distribute 40 gallons per minute, is comprised of two stations within one location – a private station for LYNX and a second station that is open to the public. Mayor Jacobs is the Chair of the LYNX Board of Directors. The Board recently decided to transition from using biodiesel to CNG to fuel the transportation authority’s buses. LYNX currently has 35 CNG buses on the road. That number is projected to double by next year because of LYNX’s plans to fuel all new buses with CNG. Nopetro built the CNG fueling station and upgraded LYNX’s maintenance facility to a more environmentally sustainable system. The fueling facility is completely privately funded and also includes a shared-revenue component with the regional bus service. “Nopetro is extremely excited to be working with the LYNX team and to bring this proven and sustainable model to the region. Our P3 approach to CNG infrastructure development is best in class and flexible to suit the specifics of any U.S. government fleet.” said Jorge Herrera, Co-Founder and CEO of Nopetro. According to Nopetro, CNG drastically reduces emissions, including carbon monoxide by 70 percent, carbon dioxide by 25 percent and nitrous oxide by 80 percent. The move supports Orange County’s Sustainability Plan, “Our Home for Life,” which is the result of the Mayor’s Sustainability Initiative that began in 2013 to plan for future population growth in a way that enhances the quality of life for current and future generations. The plan outlines specific incremental and transformative changes for the County through 2040, leading towards a more prosperous, healthy, livable, and connected community. Nopetro has developed a strong track record of developing world-class CNG fueling operations. The company operates one of the nation’s most successful public-private partnerships for CNG fueling; a tri-government P3 in Florida’s capital, with the City of Tallahassee, Leon County and Leon County Schools. Nopetro also has CNG P3 projects in development with St. Johns and Charlotte Counties. Photos from the grand opening may be found on Flickr for use by the media.